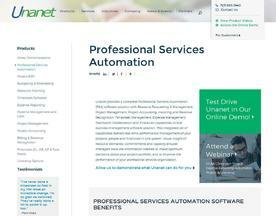 Online Professional Service Automation Software is designed to provide a company with the tools they need to manage and coordinate client projects and activities in a simple, cloud-based platform. The Professional Service Automation Software here is offered under the SaaS (Software as a Service) model, meaning that the software is web based, hosted on the Cloud and can be accessed when needed through a client or web browser. If you’re interested in online software similar to Professional Service Automation Software, consider our Project Management or Project Portfolio Management Software. Unanet’s integrated Professional Services Automation solution offers real-time management of people and projects including Forecasting, Time and Expense Management, Project Accounting, Invoicing and Revenue Recognition, Resource Requesting, and Teamwork Collaboration capabilities.